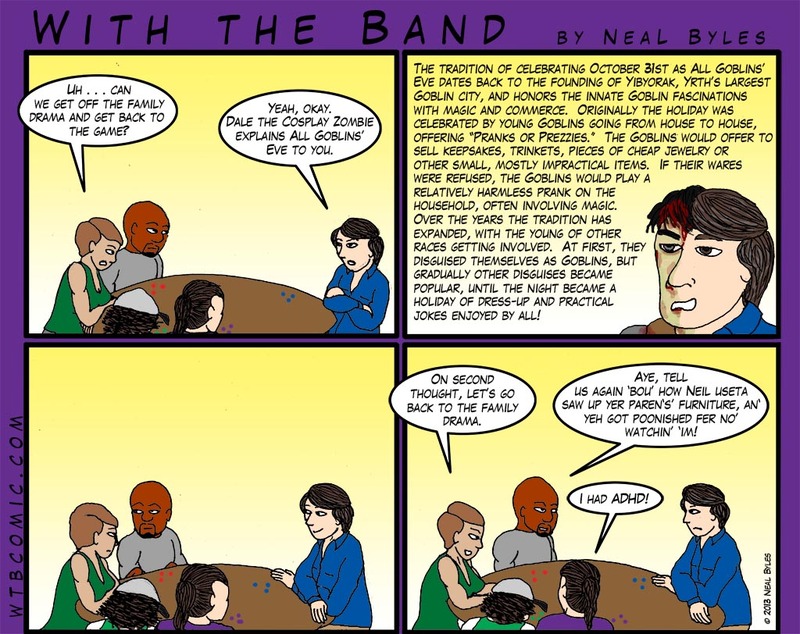 New to “With the Band?” The current story arc, “Yrth of a Hero,” starts here (and you can go to the beginning of the strip by clicking on the double-necked guitar at the bottom left)! “All Goblins’ Eve” is not an official Yrth tradition, but a creation of my own that I used in an adventure for my GURPS campaign. In fact, it is that adventure that largely drives the plot of “Yrth of a Hero.” In the original game, it wasn’t the group’s Elf archer who jumped the gun, but rather the battlemage, “Corenth.” He nailed the entire group of hapless cosplayers with an explosive fireball, which I thought was overkill, even for a comic.